When I lived in Italy, the one meal that became a repeated source of disappointment was breakfast. Don’t get me wrong, I was entranced by the dainty cups and spoons, the mysterious drink requests (caffe normale con un cubetto di ghiaccio [espresso with one ice cube? ]), the sometimes oddly tetrahedral or cylindrical sugar packets, and the seemingly unlimited uses for Nutella, but I wanted more than 30-bleary-eyed-seconds to take it all in. And I wanted to sit down. And maybe have something of substance, senza zucchero? A typical breakfast in Rome consists of a shot of espresso, perhaps accompanied by a sugary pastry, consumed while standing at a bar in a minute or two. Caffe e cornetto sound lovely, but at the start of my day I like my coffee slowly sippable and my foodstuffs no more than slightly sweet. It turns out that when it comes to breakfast, I have a tough time imitating the Romans. I decided, about six months into my stay, that what I wanted for breakfast, what I really wanted, was a bagel. A dense, chewy, blistered, fresh, warm, golden brown circle of doughy goodness. Sprinkled with seeds. Or salt. I’m not sure I had ever even had a bagel that quite lived up to the standards of the mythical bagel that danced in my head. Nonetheless, when the early hours rolled around, I craved it. For weeks. Perhaps there is a source for bagels in the Eternal City (like there is in the City of Light), but I never stumbled upon it. Truth be told, I didn’t really look. I felt rather sheepish about the whole thing, like some sort of ugly American who felt entitled to every good starch, unable to be satisfied with pizza, gnocchi, polenta, in a land where pasta and potatoes have been immortalized as a respectable meal for good common people in film. So most mornings I tossed back un caffe, nibbled on some dry biscotti and looked forward to the meals at which my host country excelled. This recipe comes from Peter Reinhart’s book The Bread Baker’s Apprentice, which has been mentioned elsewhere with high praise. I’ll add my voice to the chorus suggesting you take a look at this book if you are interested in learning more about bread. Reinhart is in the final stages of work on a new book focusing on whole grain breads that I’m looking forward to. The key to the right texture here is high-gluten flour. I had trouble finding it in Chicago, but I was fortunate enough to have some generous benefactors (Dan's parents) send some my way. 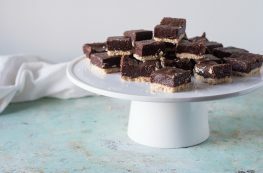 It is available online from the King Arthur Flour Baker's Catalogue. You may also substitute bread flour, according to Reinhart, who cautions that it won't be quite as chewy. I've had good results with barley malt syrup, which is available at most natural foods stores. Reinhart recommends using diastatic malt powder, which is also available from King Arthur Flour. In a pinch, honey or brown sugar will also yield tasty, if not quite characteristically bagel-like, results. 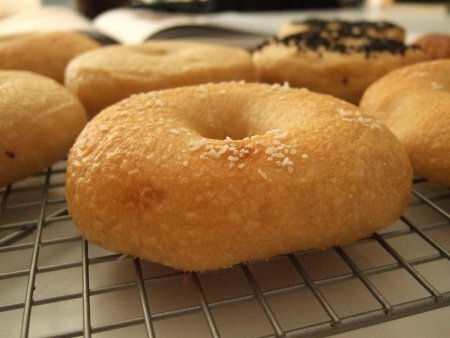 optional toppings: sesame seeds, poppy seeds, kosher or sea salt, cinnamon and sugar, etc. A day (or two) before you want the bagels: Prepare the Sponge. In a large bowl (if using a stand mixer, go ahead and start it in that bowl) mix 1/2 teaspoon yeast, 2 cups high-gluten flour, and 1 1/4 cups water until it forms a thick batter. Cover with plastic wrap and let sit until bubbly, nearly doubled in size, and on the verge of collapse, about 2 hours. Make the Dough. Add 1/4 teaspoon instant yeast to the sponge and stir. Add the salt, malt syrup or powder, and and 1 1/2 cups flour. If using a stand mixer, stir a few strokes by hand to incorporate some of the dry flour with the sponge (this will help to prevent flour from flying everywhere when you turn on the mixer). Mix on low speed for about 2 minutes, or by hand for a few minutes or until a dough ball has formed. Slowly add the remaining flour, and mix on medium speed for 6 minutes (or knead by hand for about 10 minutes) or until all of the flour is incorporated. The dough should be smooth, stiff, stretchy, and not sticky or tacky. 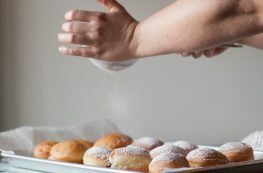 If the dough feels dry and tears easily when stretched, add a little water, a teaspoon at a time, and knead some more. If the dough feels sticky, add some flour. Divide and Shape the bagels. Line a sheet pan with parchment paper and spray lightly with oil. Divide dough into 2 3/4 to 3 ounce pieces, or, if you don't have a scale, into 9 equal pieces. (Reinhart recommends 4 1/2 ounce bagels, which I found to be too large and difficult to work with.) Roll each piece into a ball, place on parchment, cover with a damp towel and let rest for 20 minutes. With your finger or thumb, poke a hole in each piece and stretch to about an inch in diameter. Try to stretch the dough evenly to avoid thick and thin spots. Place on parchment, cover with a damp towel, and let rest for 20 minutes. To test to determine whether the bagels are ready to go into the refrigerator, fill a medium bowl with cool water. Drop one of the bagels into the water. It should float within 30 seconds. If it doesn't, pat the bagel dry, return to parchment and let rest for another 10 minutes before testing again. If it does float, pat the bagel dry, cover the baking sheet with plastic wrap. Be careful to create an airtight seal, otherwise the bagels could dry out. Place in the refrigerator overnight (or for up to two days). On the day you want the bagels (one or two days later): Get everything ready. Preheat the oven to 500°F. Line a baking sheet with parchment paper and mist with oil and dust with cornmeal. Bring a large pot of water to a boil, and add the baking soda. Have a slotted spoon ready. If you are topping with seeds or salt, have those out and ready. 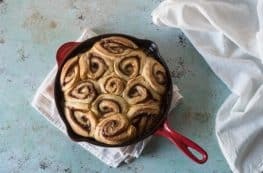 If you are topping with cinnamon and sugar, melt a few tablespoons of butter, and have a cinnamon and sugar mixture ready. Boil. Remove the bagels from the refrigerator. Place a few bagels into the boiling water. Be careful not to overcrowd the pot--the bagels will puff up a bit in the water. (I fit about 3 at a time.) Boil for 1 minute, then turn the bagels over and boil for another minute. Place on prepared parchment. (The bagels have a flatter side and a rounder side. Place the flat side down for a more rounded top.) If using seeds or salt, top when the bagels come out of the water. If topping with cinnamon and sugar, wait on that. Repeat with the rest of the bagels. Bake. Place baking sheet on the middle rack on the oven and bake for 5 minutes. Reduce heat to 450°F, rotate the baking sheet 180° and bake for an additional 5-8 minutes, or until tops are golden brown. Remove from the oven and cool on racks for about 15 minutes. If topping with cinnamon and sugar, brush tops of bagels with butter just after they come out of the oven and sprinkle with cinnamon and sugar mixture and let cool.